Ragged Company has the honor of presenting the 2011 Australian Tour of the most galactic band there ever was, the legendary, Hawkwind. 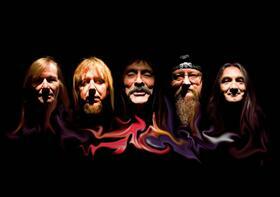 From the streets of Ladbroke Grove in the late 60’s, to the fields of Stonehenge and The Isle of Wight in the 70’s, through punk and then on to the rave culture of the 80’s and 90’s, Hawkwind are the instigators, the innovators and the oft-imitated keepers of tribal psychedelic space rock. For 40 plus years and over 26 studio and numerous live albums Hawkwind, helmed by founding member Dave Brock, have pushed the boundaries of sonic exploration, opening the hearts and minds of generations of harmonic travelers via mystical musical journeys through time and space.